Helloooo!!! Boy am I excited for this Lawnscaping Challenge to begin! I've waited to share this wonderful opportunity with all of you for weeks now!! 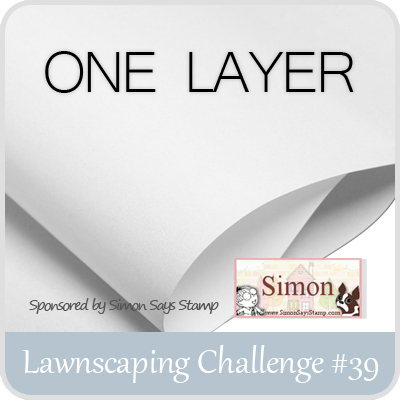 I was asked by the wonderful Laurel, and the other DT members at Lawnscaping to be a Guest Designer for this challenge! What a challenge it is! One Layer!! First, before I go any further - let me also say that this challenge is sponsored by the fantabulous ( is that a word - it is now) Simon Says Stamp!! My favorite online store for sure!! For my card - I took LF stamp sets Blissful Botanicals and Flutter By and created a floral fusion!! I did some masking on this card because I knew going in, that of course I wanted to create the illusion of dimension, but keeping with the one layer theme!! I used some Distress Inks in "Mowed Lawn", "Picked Raspberry", "Peacock Feathers", and "Squeezed Lemonade". I colored with my blender pen and used these colors to bring some life into my flowers. 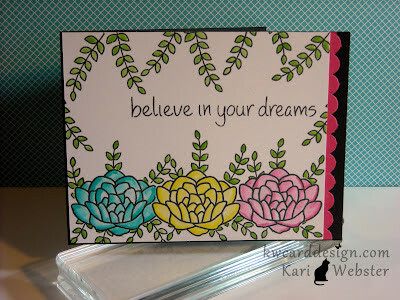 I created a bright pink scalloped border for the end of my card to break up between my card base, and stamped panel. I am proud of the way this card turned out!!! Actually, it is the first time I have inked up both LF stamp sets!! Thought it would be a VERY good time to break them in!! What an honor this is for me!! Thanks again to Laurel and the Lawnscaping family for this opportunity!! I will never forget it!! OK- now its your turn!! What kind of ONE LAYER magic will you make!! Get your stamps, ink and creativity ready!! Most of all- have fun!! Your card is absolutely beautiful, Kari! So fun to have you guesting with us at Lawnscaping! You did an awesome job! woohoooo! what a busy bloggy day you're having! congrats! i love your lawnscaping card, but i can't believe this is the first time youve used blissful botanicals. you're crazy, girl!